Honda’s UMK425 UE is a straight-shaft petrol brushcutter which offers cutting performance, versatility and outstanding convenience in a single compact package. 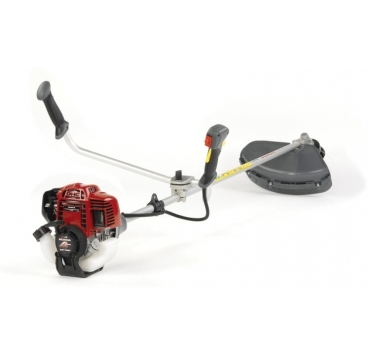 Brushcutters are an important weapon in the dedicated gardener’s arsenal, perfect for trimming edges, borders and other hard to reach areas of overgrown lawn inaccessible to a conventional lawnmower, but also excellent for clearing areas of thicker scrub too rough for most grass trimmers to handle. Designed to be just as easy to use as it is impressively powerful, Honda’s UMK425 UE is a straight-shaft petrol brushcutter which offers cutting performance, versatility and outstanding convenience in a single compact package. Key to the utility of the UMK425 UE is its dual cutting capability. For thicker areas of built-up vegetation, including nettles, brambles and weeds, the UMK425 UE features a tough three-tooth blade option which will cut through even dense scrub with admirable efficiency. When a more delicate touch is required, however, the brushcutter’s nylon line cutting system can be used to achieve a precision finish on edges and borders. Moreover, the cutting system also incorporates a protective head guard and tap-and-go line advancement for increased safety, efficiency and convenience during operation.